Boy tights. Best thing ever. Buy them. Doesn’t matter whether those pins are skinny spindly sweet little chicken legs or chunky Michelin-man squidgtastic legs, ALL babies look ridiculously bloody cute in tights. Socks always falling off? Don’t know why I’ve written this as a question. It’s a universal truth. Little kids’ socks WILL fall off. It’s just a matter of when… and ‘when’ is either a) now, or b) in about 5 seconds’ time. Whack a pair of tights underneath the trousers and voila. They’re going nowhere. Winter or chilly spring baby? We take loads of care to layer up their top half with vests, tops and knits, but what about the bottom half? Wear them under trousers as per point 2, and they’re an extra snuggly layer as well as eliminating bare flesh in that trouser-sock gap. They fit for a whole year too, so you’ll definitely get wear out of them, whatever season you buy them in. Stretchy, soft tights are a million times comfier and less restrictive to sleep / crawl / clamber around in than a pair of trousers. It’s the same reason us tired mums gravitate towards leggings. It sure as hell isn’t because we look hot in them. Unless they’re ballet dancers, most grown men are sadly deprived of the opportunity to wear tights without some degree of ridicule. Let the wee lads get away with it while they can. Obviously you can get girls’ tights from any number of places, but boys’ tights are a bit more elusive. 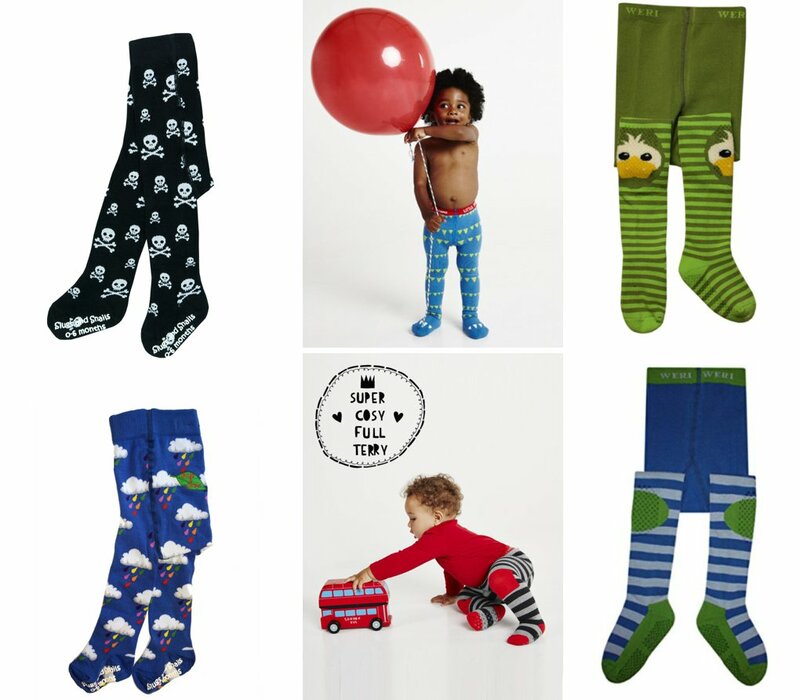 Luckily a couple of places have cottoned on to what an amazing idea they are for boys and have produced some beautiful boy-friendly ­and unisex designs. Whoever says babies shouldn’t wear black is WRONG. Perfect print for little pirates. I love a good weather print. Living in Manchester we may as well celebrate the rain. Love the colours and love a nice stripe. Also anti-slip on knees as well as feet so great for crawlers. Huey’s favourite animal is a duck, so these are a winner. Ducks on the knees and a massive duck for that squidgy bum. Tights from these places above are nice and thick, designed for wearing on their own, but if you’re just after some thinner ones to wear under trousers, H&M, Next and Amazon do some great plain ones in unisex colours like grey or navy. Do any of you know of any other great boy-tight suppliers? Please do feel free to share in the comments!